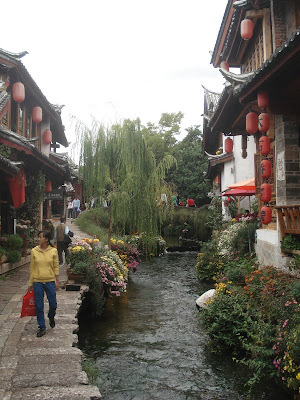 Lijiang is picture postcard perfect city in Yunnan. 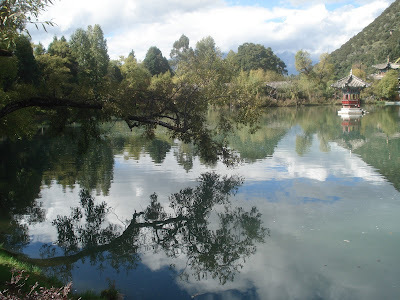 Magnificent estates are hidden among narrow knots of streets and a beautiful lake reflects the mountains behind it. Although Lijiang has 800 years of history, many of the ancient style dwellings in the town were actually built after a devastating earthquake in 1996 flattened many high rises in the area. 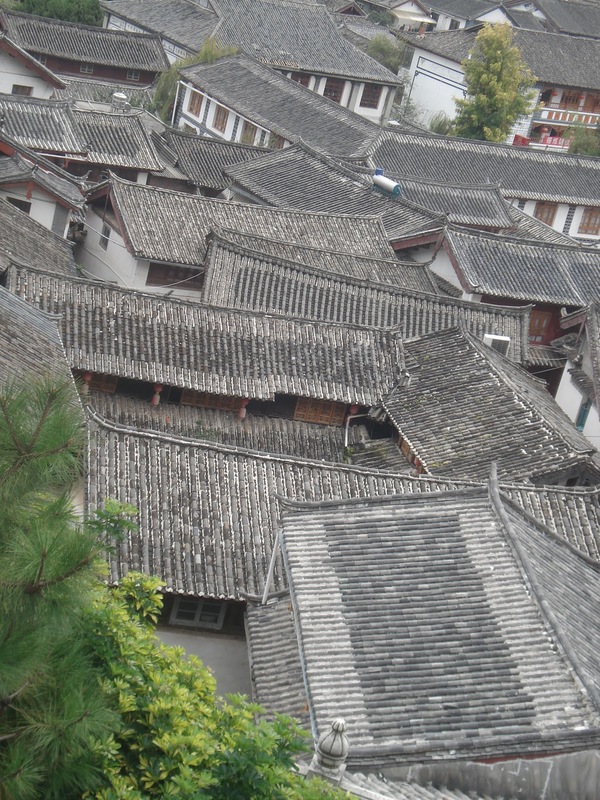 Now a Chinese version of a Lord of the Rings movie set, the old town is dissected by narrow waterways and connected by quaint bridges. Sporting a maze of cobblestone paths, I was able to find my hostel with great difficulty. The rulers of the Naxi tribe that inhabited Lijiang lived in the intricately designed and ornately decorated estate known as Mu's Mansion. 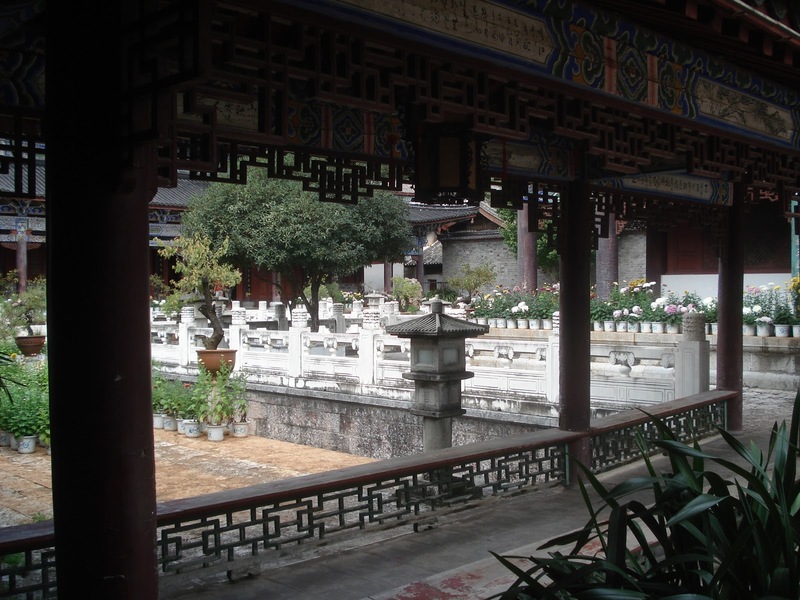 With a sprawling courtyard and relaxing trails leading up to temples on a hill side behind the complex, the mansion provides some room to breathe compared to the claustrophobic alleys and tight living quarters outside the estate walls. 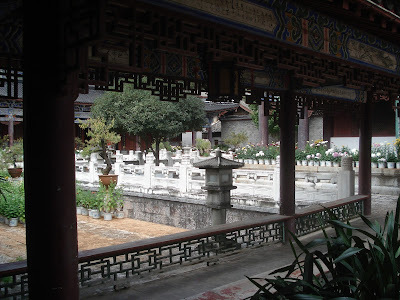 A brisk walk away from the center of the old town leads to the Black Dragon Pool. 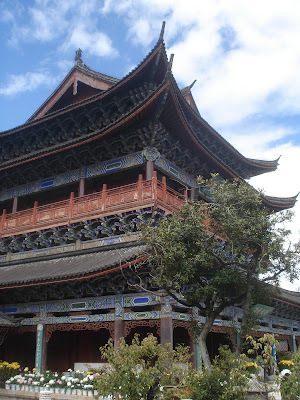 Boasting one of China's signature views, the pool mirrors a bridge, a pagoda, and snow capped mountain peaks borrowed from the scenery behind. It is a popular picnic spot for locals and visitors alike. Water from the springs come together to form this pool, which in turn pours into a waterfall that streams into the old town. 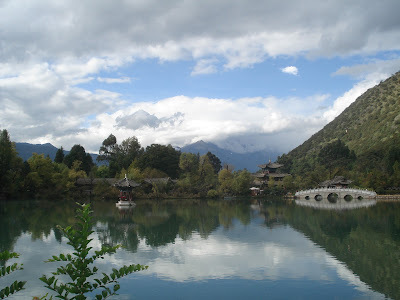 I would head to Tiger Leaping Gorge from Lijiang, leaving behind man made beauty for nature's splendour. To commemorate my two year anniversary in China, I went to the Little Sheep hotpot restaurant in Guomao with my colleagues. Our cute server had caught the eye of my coworkers, and they peer pressured me into talking to her. Coworker #1: You should talk to the waitress! Me: No, I don't think she can speak English. Me: But you know what will happen if I speak to her in English. First the left cheek will turn red, and then the right cheek will turn red. Me: I meant my cheeks. Me: Maybe I can ask her for napkins? I need some. Me: Square paper for wipe face. Coworker #2: Ask her for toilet paper. Coworker #3: No, ask her where the toilet is! Coworker #2: That is good idea. I approached the waitress and asked her for the toilet, bathroom, washroom, and WC without success. I pointed to the sign for the toilet. She finally understood and guided me to the bathroom. I returned to the table where my coworkers were sitting and told them what had transpired. Coworker #2: If the sign already point to toilet, why you ask her then? You are idiot! I asked a colleague if he had been to a particular Chinese restaurant that I wished to visit. Coworker: Yes, I have been there for a failed wedding meal. Me: Why was it a failure? Not enough food? Not enough beer? Coworker: The meal was excellent, the marriage failed. Coworker: You are always the backup boyfriend. Me: Yes, unfortunately I am every girl's second favourite man. Coworker: I mean even if she leaves the first boyfriend and gets a new one, you will still be the backup. Coworker: Chinese saying - 'Good medicine is bitter, good advice cruel'. Research suggests the average person passes gas around 10-20 times a day, with some overachievers emit as many as 50 farts a day. A guy blows his horn about 10 times for every 8 times that a girl fluffs. Although the volume of flatus released by the man is greater, the stench is more concentrated in female farts as they do not disperse the odor as frequently. Despite these facts, gender and racial stereotypes have made me the victim of vicious fart attacks by women across the world. During my school days when I was standing beside a group of girls and one let out a silent but deadly fart, all sets of eyes would immediately and accusingly turn towards me. I was always found guilty in the court of public opinion without being given a chance to defend myself. One of the girls had temporarily suspended traffic from passing through her southern route, waiting to synchronize her release with my arrival. This seemingly innocuous behaviour is actually a cunning stratagem to pass the blame of the foul stench on to the most likely candidate as perceived by the masses - me. Even in China, girls will let out a fart when I am standing nearby or as I walk past them. I frequently smell farts in crowded buses and trains wafting around me. When I look around trying to identify the perpetrator, I see disapproving gazes being directed at me from the petite ladies in the blast radius. Only two of us know that it was not I who had cut the cheese. When I complained about this atrocious behaviour to a Chinese girl, she said I was being paranoid as she farted discretely. "Whoever smelt it, dealt it." Korean guy: I am going to a cat buffet now. Me: I have never been to a cat buffet before! Korean guy: I can show you where it is if you want. Me: OK, I'd like to check it out. How much does it cost? Korean guy: Not too expensive. Korean guy: Yes, you can even bring your own cat. We walk over to the entrance of the cat buffet. There are pictures of several of the cute critters on a billboard outside, with images of various dishes below. Me: Hmm, here it says 'Cat Cafe' only. Are you sure it's all you can eat? Korean guy: What do you mean? Korean guy: What?? No! I said cat cafe, not cat buffet! It's a place where you can bring your cat and hang out and have coffee and some snacks.